He’s one of those who have been symbols of the avant-garde in New York, but his relation with that city has changed, because – he says – «it’s not the same». The multifaceted sound artist Elliott Sharp talks to GPInformation on this subject, as well as on his work and its origins and identity.Let’s start by the present. What are your current projects? In what are you working these days? I’m in the middle of composing a 45-minute piece, “Polymerae”, for Frankfurt’s Ensemble Modern, that will premiere in April with the dance company of Jacopo Godoni, and I’ve just completed a piece titled “Sidebands”, dedicated to Karlheinz Stockhausen for the Fylkingen Festival in Stockholm in February. I’ve also just finished recording a set of my recent string quartets with the Sirius Quartet. There are also recently recorded improvised duos with Frances-Marie Uitti, Josef von Wissem, Scott Fields, and Saadet Turkoz.Throughout your career, you have been developing a close relation between “conventional” instrumentation and electronics. However, in the “Sharp? Monk? Sharp! Monk!” project your option was to play only with a guitar. Was that a conceptual option, or did you just felt that it just was the best way for interpreting Thelonious Monk? I often play acoustic guitar at home and Monk’s music is something I enjoy playing. It seemed natural to record it that way. I’ve done a number of fully acoustic recordings in recent years and I like the sound very much.After the more “classical” sound of previous projects, “Hums 2 Terre” brought you back to more experimental territories. Was that intentional on any way, or was it only a part of a natural process? I don’t believe I’ve ever left any of my operating zones – through-composed orchestra pieces, “experimental” work, improvisations, blues, film scores, electronic and computer music. They’re all parallel threads.You have studied a wide range of academic disciplines, like for instance, ethnomusicology. What’s the importance of that scientific background on your musical production? And, in the same line of thought, how does physics reflects on your work? Everything I read or study ends up being part of the process! I do like the way mathematicians and physicists map reality to abstraction. It’s very resonant with the way I compose and I like to imagine my musical processes as operating in a similar way. Probably this is a limitative question, but – and in spite of your other influences – would you consider blues and jazz to be a kind of a “skeleton” of your musical work? I don’t know if I would put it that way. I grew up listening to and playing blues and jazz – they’re as much a part of my daily life as speaking English or drinking coffee. The first jazz record that I really “heard” was John Coltrane’s “Live at The Village Vanguard” – I listened to it because of his published obituary in the “NY Times” the day of his death. It whetted my curiosity and a friend’s father had the record which we put on – I was blown away by it! Next for me was the Mingus record “Oh Yeah” on Atlantic – absolutely killing. I became very excited by jazz and tried to listen to everything I could get my hands on, searching record store bargain piles (because I had no money!) and in libraries. When I became a radio DJ at Carnegie-Mellon University’s WRCT during a summer session there, as a “junior scientist”, when I was still in high school in 1968, I dug into the ESP records as well as lots of Ornette, Ayler, Cecil Taylor, Pharoah Sanders, Sun Ra. My exposure to blues started with The Yardbirds and The Stones and I soon was listening mostly to Howlin’ Wolf with Hubert Sumlin, Muddy Waters, Lightnin’ Hopkins, Skip James, Robert Johnson, Sonny Boy Williamson, Big Joe Williams, Blind Willie Johnson, Otis Rush, Albert Collins, B.B. King, Albert King, Freddie King. As soon as I began to explore music, I was into the outer limits. I was a science fiction fan growing up and I loved the soundtracks to sci-fi films (and still love), Bernard Herrman’s score to “The Day The Earth Stood Still” and “Mysterious Island”, as well as the wonderful electronic soundtrack to “Forbidden Planet” by Bebe and Louis Barron, which I first heard around 1963. My access to the music library at WRCT allowed me to dig in deep to various composers such as Cage, Stockhausen, Xenakis, Partch, Ligeti (saw “2001:A Space Odyssey” that Summer as well with Ligeti’s incredible music) and more. I’m most comfortable with guitars but when I have the time to keep in practice I truly love playing saxophone and clarinets. While performing live, do you prefer to perform “prepared” works, or just improvise, taking yourself by the moment? I like them all – it’s only dependent on the desired situation. I can’t help having in mind your contribution for the “Alphabet City” album (released on the Sub Rosa United Series). In which way are you inspired by cities, in general, and New York, in particular? New York was (and I’m using the past tense purposefully) a very inspiring place for creative work. I still love living here but it’s not the same – it’s about marketing and consumption, not about living out a creative fantasy and manifesting it in art. I arrived back from Warsaw the day before. My main thoughts were anger at the people who perpetrated this horror – NOT the ones who piloted the planes but the government of George Bush and his cohorts in the corporate oligarchy. If not actually ordering the attack, their policies created the conditions. There’s too much to go into here! After these years, what’s your vision on what was changed in the city, both from the social and artistic points of view? This city is controlled by real estate forces. Its character has changed and there’s not much we can do about it in terms of keeping it vital as a creative place – cities change and the creative force moves to other locales. Not at all. “Jewish culture” had almost always been radical, but this particular movement is very Zionistic and reactionary. I presented my piece “Intifada” at the first Radical Jewish Culture festival in NYC, at the Knitting Factory, and I was booed and shouted down when I gave a preamble to the concert saying that Judaism, whether cultural or religious, is not necessarily the same as Zionism and that as the son of a Holocaust survivor, I find the Israeli oppression of the rightful and long-time inhabitants of the area known as Palestine to be shameful and abhorrent. I greatly dislike religion and nationalism – the source of much human suffering! Artists like Zorn himself or Z’ev have inspired some of their works on the jewish heritage. Did you ever have a similar approach? Just as all of my work is informed by my interest in the sciences and acoustics, all of my work is informed by my Jewish heritage. I just don’t wear it on my sleeve! 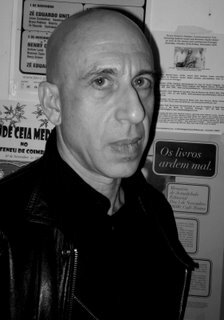 Muito interessante esta entrevista ao Elliott Sharp, é de facto um músico com muita bagagem e consciência do real. Sou um fã deste ARTISTA, que não tem o mínimo receio nem preconceitos em disparar em várias direcções, tudo no sentido do primordial objectivo: Criatividade ao serviço de TODA a raça humana.